When you’re starting a gardening business, be it gardening, selling products or offering landscape design services, you’ll need various forms of equipment to get you started. Here we offer a look at some of the items of equipment you may need to consider. There’s a lot to think about when you’re starting to run a business, but one key element is getting yourself equipped with all the items you need to successfully run a business. If you’re starting a gardening business from scratch, you’re likely to need a number of essential items to get you started. Gardening tools, such as a trowel, spade, shears, fork, kneeler, watering can, wheelbarrow and secateurs. Garden products, such as compost, lawn care items, paving and soil. Plants, such as flowers, trees, shrubs and seeds. Large pieces of equipment, such as a lawnmower or hedge cutter. Gardening wear, such as gloves and other safety items. Garden design tools, such as a drawing board and laptop to create designs on. These are just a few examples and you may well think of many more – when you start thinking them through or writing them down, it’s amazing how they add up, both in number and in terms of cost. If you’ve written a proper business plan, these essentials should have been included within it and ideally budgeted for, so you know how much you can buy at the outset and what you need to save for. If funding is initially an issue, you could always hire gardening equipment, especially the big items that you may only use occasionally or on certain jobs, as this is one way of helping to spread the cost and free up cashflow. Display stands, for displaying products or photos of gardens you’ve designed or worked on. One way of obtaining items in the first instance is to buy them from an office wholesaler, but it can seem quite costly when funds are tight. Office equipment and other items are tax deductible, but if you want to avoid a huge outlay, there are other options to consider.Pieces of equipment can, for example, be rented or hired for a set period of time. This method could help you get going without having to spend too much before you’ve earned much with your business and, in some instances, you can decide to buy the equipment you’re hiring for a discounted rate. In the case of computers or laptops, this means you get the added advantage of testing out certain makes before you commit to buying. 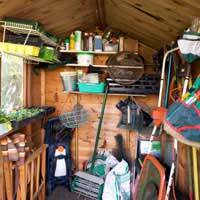 Or, if you’re after specialised gardening items, then perhaps you could ask to borrow them from friends or family or approach a firm and ask if they’ll let you borrow them for a short period. It may be a bit of a rare situation, but if you’re able to offer free promotion back to the companies in question, it may be allowable. Thank you!Very helpful information with a good basis to start. We are glad this can be of help. Good luck! Thank you! Very helpful information with a good basis to start. Hi, I'm looking to start slowly by reducing hours at work and as the business picks up spend more time on gardening. What qualifications (RHS Level 3 is where I intend to get to, nothing held as yet) are required for starting out, just maintenance initially?Many thanks! While no qualifications are needed to become a gardener, you will need to know about the more obvious jobs such as lawn mowing, lawn repair/renovation, pruning, spraying pesticides, fertilising or soil care, and if you're not competent a customer will quickly know if you are unsure or don't have the full knowledge. Therefore a gardening maintenance course will help you become more confident in this area. There are some online garden maintenance courses, however we are unable to recommend specific organisations. The National Careers website would recommend courses covering things like identification of plants, growing plants from seed and how to use gardening machinery safely. I'm afraid we cannot be more specific in our recommendations, but a bit of research should pull up the courses you'll need. Good luck. Please provide me with ideas eg, photos, business plan, equipment, chemicals etc which regard my future gardening business. I'm afraid these things are things you would have to sort out yourself. We can only give the general advice contained in this article and the other articles you may wish to read in the series. I have applied for funding at NYDA so I need help and advise on which gardening and cleaning services equipment to buy. @lg _ I'm afraid you don't know whether it will work and that is the gamble you take. There is a lot of learning to do when you start a business and I'm afraid a lot of that is through making mistakes or making wrong or even costly decisions. Plus, as explained in the article, you have to buy all the equipment you need to enable you to start. There is also the issue that the business is seasonal, so you may have too much work on in the summer and feel that you can't fit all your clients in and then in the winter it can dry up and you have no work at all. What you don't want to do is to go into it half-heartedly, the best thing you can do is believe that it is going to work, and that self-belief will be your driving force to make it work. If you have the drive and ambition to succeed, and you are not afraid of working very long hours, then you will, whatever the obstacles. @Papaikie - Thrive is a national charity that uses gardening to change lives. Its Growing 4 Life project was set up with the support of Ecominds and the Big Lottery to work with older people with mental health support needs, using the therapeutic powers of gardening to help people regain confidence, build self esteem and motivation as well as creating new social networks.The learning outcomes and evidence gained through delivery of the project has been used to produce this free resource guide to setting up a community garden project for people affectedby mental ill-health link here. I hope this helps. Is it possible to send me a sample of gardening business plan? Gardening could be beneficial especially to aged people like me.I love to work outdoor mostly on sunrise,it's healthy.And youget free fresh veggies and maybe a little cash as a good start.